Thank heavens, for Good Ole' Baking Soda. I am still using baking soda as my facial scrub, a year later. No complaints here! ...And my money stays in my purse! LOL! So my new facial regimen consists of Olive Oil & Vitamin E (both already were in my cupboard) ... And soon enough, Castor Oil is next on my list, thanks to The Oil Cleansing Method! And after that, Honey. The following method is a natural and affordable way to clear, glowing, dewy-looking skin, free of blackheads, pimples, cysts, and other imperfections. When cleansing and moisturizing your skin, it is imperative that you keep in mind that oil dissolves oil. Do not fear, those of you (like me) who may have oily skin. Your skin naturally produces oil because it needs it. Natural Oil is there for the benefit of our skin, allowing our largest organ to function properly. Mainstream skin care products strip the natural oil out of our skin, leaving our largest organ trying to repair itself by replacing the oil stripped away. This leaves us in a cycle of being tight and dry followed by the inevitable oil slick. The Oil Skin Care & Cleansing Method's basic concept is that oil used to massage your skin will dissolve the face's natural oil that has hardened with impurities and found itself stuck in your pores. The steam will open your pores, allowing the oil to be easily removed. If necessary, the smallest drop of the same oil formula patted over damp skin will provide the necessary lubrication to keep your skin from over-compensating in oil production. 1. Castor Oil has potent anti-inflammatory properties, but is also healing and cleansing, which is why we're focusing on this oil as our primary oil. A little bit of Castor Oil goes a long way and too much will leave you, surprisingly, with dry skin. Since Castor Oil is so thick and its cleansing properties so strong, we need to dilute it with another oil, thinner in consistency, but no less nurturing to the skin. 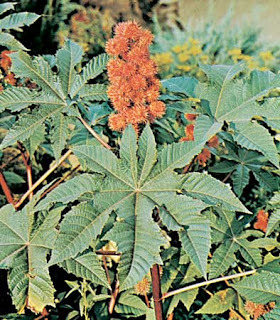 Castor oil has also been shown to prevent and treat skin wrinkles, to lighten age spots, and to reduce the effects of stretch marks. 2. The secondary oil that you choose is entirely up to you and should be determined by your skins needs and the properties of that oil. Other oils that can be used are Extra Virgin Olive Oil or Sunflower Oil. Choose a natural, cold-pressed vegetable oil, since it has nutrients, vitamins, and fatty acids that mineral oil and other refined oils do not. Create your own, personalized skin cleansing oil blend, knowing your general skin type. Those with dry skin will want less Castor Oil. Those with oily skin will want to blend in more. Keep in mind that Castor Oil is the drawing, cleansing, and purging oil for your pores. TheSecondary Oil of Your Choice is to dilute the Castor Oil in thickness and additionally provide moisture, nutrients, and other benefits. Oily Skin: Try a blend of 30% Castor Oil to 70% Secondary Oil of Your Choice. Balanced Skin: Try a blend of 20% Castor Oil to 80% Secondary Oil of Your Choice. Dry Skin: Try a blend of 10% Castor Oil to 90% Secondary Oil of Your Choice. Typically done in the evening, prior to bed. This deep cleansing method should be done regularly, but not too frequently. Do not over cleanse the skin as this will serve only to irritate and cause more oil production. The objective of using this method is to deep clean while balancing the skins oil production at the same time. - You'll need a soft washcloth, your oil blend, and hot, running water. - Pour a generous puddle of oil into the palm of your hand. Roughly, the size of a quarter, but more is acceptable. Rub your hands together to warm the oil and smooth over your face. - Begin massaging the oil into your face. This will remove makeup, dirt, and other impurities, so there is no need to use a makeup remover or wash your face prior to the massage. - Using slow, firm motions across the skin, massage the oil deeply into your pores. Take your time and focus on your problem areas. You want the oil to work into your pores so that blackheads and the like can be dissolved and steamed away. - Massage your face, let your mind drift off to something calming and breathe deeply. Take this time to relax and release some of the stress that your body is harboring. Sit down, breathe deeply, and take your time. Give the oil enough time to work on dissolving the impurities in your pores and give yourself enough time to unwind. Picture what your face would look like if it were completely clear and free from blemishes. Focus on that image and know that it is attainable. Trust that it is attainable. Accept that it is attainable. You can have clear skin, free of blemishes and you will have clear skin, free of blemishes. Focus on perfect skin and breathe deeply. - Once you're satisfied that your pores are saturated and you're feeling calm, pick up your washcloth and soak it in clean, steamy water. The water should be warm enough to open your pores and remove the oil. Cool water will not open your pores, nor will it remove the oil efficiently. Steam skin to coax our pores to release the oil carrying the impurities. Essentially steaming the skin as an esthetician would, but without the luxury of a steam machine. - Hold the washcloth to cover your face. Allow it to stay until it cools. You will feel your pores releasing the impurities. Wipe the oil gently away and rinse the washcloth well in hot, running water. Hold the washcloth to your face again, allowing it to cool. Wipe gently, rinse well, and repeat two or three more times. Avoid any temptation to scrub, as you'll find it's completely unnecessary and your skin will be soft, smooth, and free of flakes without the additional manual exfoliation and irritation that will result. Impurities, dead skin cells, and bacteria will be gently swept away. - Have no fear of the oil, as the steamy washcloth will remove it. The Castor Oil, though it is an oil, will help with the removal of the other oils, as well. It is our main cleansing oil and is easily removed with warm water. - If your skin feels tight, take a tiny drop of your oil blend, rub it between your clean, damp palms and pat it onto your damp skin. Gently massage any oil residue into your skin so there is no film of oil left sitting on the surface. Your skin should now glow! Don't be surprised if you find you've unblocked an oil flow for the first few days. Once you remove the plugs from your pores, they will begin functioning properly again. Perfect skin won't happen overnight and while it should take a few massages to achieve your goal, you should notice a huge difference in your skin after the first deep cleansing massage. Give your skin a few days to adjust and adapt to being clean and clear of blockages; understand that the new oil coming from your skin is actually a good sign and will balance out very shortly. You'll find redness and irritation subsiding. You'll find your skin losing that "congested," and thick feeling. Hmmm interesting..I will try!! Thanks Nyree! PS: yes love the baking soda..I refuse to buy anything else..lol..it's great! Wow ... girl i LOVE this blog. I spend so much time here on a weekly basis. I am definitely going to try the castor oil and olive oil as my mix. Also I read about the arm and hammer mix. Can it really be used every day? Hey Andra, yep ... I use baking soda every day on my face. And I have a few other friends who use it too! Let me tell you, for the price you can't go wrong! LOL!